Advanced Dungeons & Dragons, a form of the most well-known roleplaying game of all. AD&D is no longer published as that name; as of August, 2000, both D&D and AD&D have been merged into the new Dungeons & Dragons Third Edition, or D&D 3E (see below). The original AD&D differed from basic D&D (see below) in complexity of play; AD&D was known for having a wider variety of rules and options, while Basic D&D was popular with new players and experienced players who preferred a simpler set of rules that could be used for more freeform gaming. 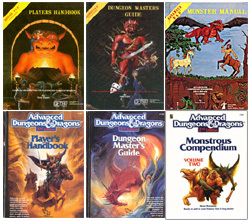 Covers of 1st edition (top) and 2nd edition (bottom) AD&D book covers. Game term used in all forms of Dungeons & Dragons. Armor class is a numerical rating of how hard a character or creature (or occasionally even an object) is to hit and damage with a weapon. Factors such as the size, speed, dexterity, and outward toughness of the target are considered. In Third Edition D&D, armor class numbers increase to reflect difficult targets (a 1 AC is easier to hit than a 10 AC, for example). In all earlier forms of D&D/AD&D, AC numbers decreased, in a range from 10 (the worst, or easiest to hit) to -10 (the hardest to hit). A simpler, less rules-heavy version of Dungeons & Dragons, Basic D&D was the first version of the game, and was used for a long time as the introductory level. All present versions of D&D have been merged into Dungeons and Dragons Third Edition, or D&D 3E (see below). Any game that is simple and quick to play, with a minimum of strategy or mental effort. The "beer and pretzels" refers to having refreshments while the game is being played - such consumables are not required to enjoy the game. This term is usually used to describe board or card games, but a handful of roleplaying games carry this label as well. Victim of Cthulhu, shown here for scale. 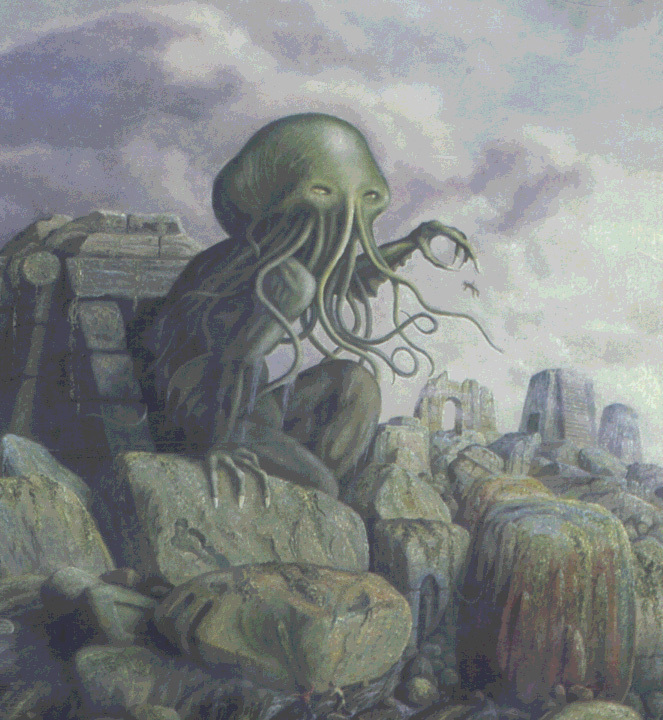 Cthulhu: A massive extraterrestrial creature buried in R'leyh (ruh-LIE-yeh), an ancient sunken city. 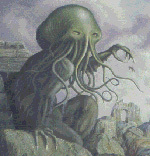 Cthulhu is portrayed has having an octopoid head, a reptilian body, and wings like a dragon; merely viewing his massive and terrible form is enough to drive most people insane. The Call of Cthulhu: Short story written by Howard Phillips Lovecraft in 1926, regarding the discovery of a cult that worships Cthulhu and wishes to wake him from his slumber. Call of Cthulhu: A roleplaying game based on the characters, creatures, and concepts of Lovecraft's stories, including, but not limited to, The Call of Cthulhu. In it, players play characters from the 1920s (and sometimes the modern day or 1890s) who encounter or are investigating supernatural phenomena and horrible, sanity-blasting creatures. Call of Cthulhu has a reputation as a bleak, hopeless RPG where characters rarely survive long enough to carry on into very many continuing adventures. Unlike other roleplaying games that reward adventures and experience with improved abilities and a higher hit point total, CoC characters wear down over time, as they gain physical injuries that are difficult to heal and lose Sanity points from encountering too many Things That Man Was Not Meant To Encounter. Despite this, or possibly because of it, the game has developed a close following since it first appeared in the early 1980s. To some, there is a great satisfaction in playing those who fight great evils at the cost of their own health and sanity, so that others may live healthy and sane lives. Abbreviation for Collectible Card Game, a type of game in which participants play with a deck of cards that they have customized with any of a larger selection of cards. The CCG craze was begun by Magic: The Gathering. Most CCGs are purchased in starter decks and booster packs - the starter deck often allows a player to start playing right away, and the booster packs contain a smaller amount of cards that can be used to augment an existing deck or build a new one. Players construct a deck of cards that work well together to accomplish the goal of the game. The role played by a person participating in a role-playing game or LARP. This concept is very similar to the role that an actor or actress plays in a movie. In most games, a character is defined by a set of abilities, skills, attributes, and the like. A character with a high "Strength" attribute, for example, would be stronger than a character with a mediocre one - likewise, a high skill level in Driving would allow feats that an average driver would never be able to manage. Unlike an actor's role, a character in a role-playing game is completely under the control of the player - there is no script to read, and all actions and dialogue are supplied by the player. Abbreviation for Call of Cthulhu; see above. 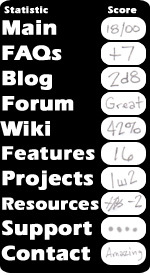 A form of shorthand created to let players of an RPG know the amount of dice that should be rolled to achieve a result. The number after the "d" indicates the type of die to be rolled; i.e., a d6 is a common, garden-variety 6-sided die. The d100 (also called the d%) is usually rolled on two 10-sided dice, and is often used to determine a percentage. This shorthand is often preceded by another number, which indicates how many of the indicated dice should be rolled; i.e. 2d8 means that two 8-sided dice should be rolled, and the results added together to achieve a random number between 2 and 16. Modifiers are often added to the shorthand to add or subtract from the total: 4d6+5, for example, means to roll four six-sided dice, add the rolls together, and then add 5 to that total. For more on the different types of dice, see the entry for dice, below. Dungeons & Dragons, the premiere RPG originally produced by TSR, and now owned by Wizards of the Coast, the same company that brought us Magic: The Gathering. The third edition of D&D, also known as D&D 3E, was released in August of 2000, and has merged AD&D and basic D&D under the same name. A third edition revision was released in 2003, and is often referred to as D&D 3.5E. Role-playing games are known for using a variety of "unconventional" dice. d4 - A four-sided die. At first glance, the way a d4 is numbered causes a little bit of confusion as to how it should be read - on newer d4s, the topmost number is the result of the roll. On older d4s, the bottommost number (the one closest to the table) is the result. Some eight-sided dice (see below) are designed to replace the d4 - instead of having faces numbered 1 through 8, they have the numbers 1 through 4 on two faces each. Such dice are uncommon. d6 - A six-sided die, the most commonly recognized type of die. Some six-sided dice use "pips," or dots, to indicate the number rolled. Others replace the pips with numbers. d8 - An eight-sided die, with faces numbered 1 through 8.
d10 - A ten-sided die, usually numbered 0-9 (rather than 1-10). When a d10 is rolled alone, the 0 is counted as a 10. These dice are numbered this way due to another purpose that the d10 serves - generating a number from 1 to 100. This is sometimes called a d100, d%, or percentile roll, as it can be used to determine the percent chance of success in an action, or the occurring of an event. In this method, two d10s of different colors are rolled, (or the same die is rolled twice) with one die counting as the "tens digit," and the other as the "ones digit." If the first die rolls a 4, and the second a 2, the result is a 42. A result of 0 on the "tens digit" die indicates a single-digit number (1-9), unless followed by another 0 for the "ones digit", which indicates a result of 100. Not all d10s are numbered this way - some are numbered 1-10, particularly ones that are meant for RPGs that use dice pool systems. d12 - A twelve-sided die, with faces numbered 1 through 12.
d20 - A twenty-sided die, with faces numbered 1 through 20. Some d20s, especially very old ones, were not numbered 1-20, but rather 0-9 on two sides each. This allowed them to also serve double duty as d10s or percentile dice (see above). Gamers who wished to use one as a d20 would either color one set of numbers with a different marker or crayon, or roll a second die to determine if the original number should have 10 added to it or not. Other dice - Many gamers have acquired an interest in more unusual and uncommon dice. Some are dice that roll ranges of numbers that are not covered by the above dice (such as the d16 or d30), others are dice that have symbols or words on their faces (such as FUDGE dice, which are six-sided dice that bear two blank faces, two negative signs, and two positive signs), and others are meant as replacements for other dice rolls (such as the d100 shown at right). Die shorthand - A special form of die shorthand exists which expresses how many and what type of dice are to be rolled, and if any modifiers are to be applied. For more information, see the entry on dice shorthand above. A game system that uses no dice. 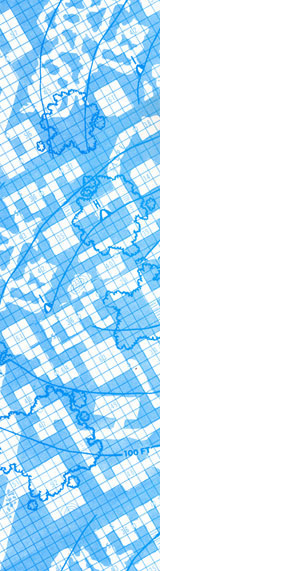 Some systems replace the dice with cards, while others do not use a method of random generation at all. A game system that uses a "pool" of dice whenever an action is attempted or a result is needed. The pool consists of a certain type and number of dice, depending on the rules of the game. All of the dice in the pool are rolled, and the result is calculated by the total of all dice, or the results of each individual die. For example: in the original World of Darkness games, a character rolls a pool of ten-sided dice based on one ability and one attribute. A character trying to jump from one rooftop to another would add their Dexterity attribute to their Athletics ability, then roll that amount of ten-sided dice. Each die that rolls an 8 or higher counts as a success. Some tasks will only require a single success, while other more difficult tasks may require more. In the Godlike RPG, a dice pool of d10s is rolled and matching die results are collected. The success of the action is based on the "width" (number of matching dice) and the "height" (the face value of the matched number), with higher widths and heights being preferred. In the Prince's Kingdom RPG, a dice pool of varying types of dice is collected, based on the strengths and weaknesses of the character. These dice are rolled, and the character and his opponent begin a bidding session, using one or more of the dice to bid, see, and raise the other, as they roleplay their participation in the conflict. (from Dungeons & Dragons) The player in a game of D&D who acts as a referee, telling the other players what they see, hear, etc., the results of their actions, and the actions of the other characters in the story. Other RPGs use a different term for this role. A game term originated in Dungeons & Dragons (and used in some other RPGs) to simulate the experience that a character recieves from participating in adventures. Experience points are tallied by the Dungeon Master for defeating monsters, accomplishing adventure goals, and occasionally for excellence in roleplaying or strategy during an adventure. These are awarded to the players at the end of the adventure, and are added to an accumulated total for their characters. When specific point totals are reached, the character's level goes up, and their abilities improve, such as their skills, spellcasting ability, or other special abilities. Other roleplaying games use similar systems - some may call them character points or plot points, and award them on the spot, instead of at the end of an adventure. Some systems allow the players to spend the points on character improvement, and in some games a character can spend them for in-game perks, such as rerolling a bad die roll or getting a bonus towards a specific action. Abbreviation for fantasy role-playing, a term that is synonymous with RPG. Abbreviation for Game Master. See DM, above. Acronym for Generic Universal Role-Playing System, a system of role-playing rules created by Steve Jackson Games. GURPS allows the referee and players to play in any setting they choose, using the same basic ruleset. With GURPS, gamers can play in fantasy, science fiction, horror, historical or espionage worlds (to name a few) with a minimal change in rules. GURPS accomplishes this by publishing a core set of rules, along with separate setting and supplemental rulebooks to give many options to the players. A term used in many roleplaying games (and even some video games) to gauge the overall health of a character, creature, or sometimes even an inanimate object. Hit points are reduced whenever a character (or creature, etc.) takes damage points from a fight, a fall, or any other hazard. When the hit point total reaches zero, the character or creature is dead, or possibly incapacitated (depending on the rules being used), or the item is destroyed. Some RPGs rename this term (to something like wound points, damage points, or life points), but use the points in the same way. Others have different systems of determing a character's capacity for physical damage. Abbreviation for "in character," a term meaning something that a player does while acting in character. Abbreviation for "in real life," usually used in online discussions, to make a distinction between events that happen in the game and events that happen in reality. "I was just about to hack into SuperMegaCorp's mainframe, when Charlie spilled his soda!" "What, all over the keyboard?" "No, IRL, all over my character sheet!" Acronym for Live Action Role-Playing. For more information on LARP, visit the Basic Gaming FAQ. This term can have several meanings, especially in D&D. In most of the games on the market, a skill level is a number or other designation that establishes how skilled a character is in something. The higher or better the skill level, the better the character is at the chosen skill. In D&D and AD&D, a character is described as having a level (i.e. 5th level fighter, 9th level wizard); this is used to describe the general experience and might of the character; higher, as expected, is better. D&D also has dungeon levels (not commonly used anymore, but it describes the difficulty of the monsters, traps and et cetera in a dungeon), spell levels (denoting the difficulty and power of the spell in question) and monster levels (which indicate the difficulty of defeating a particular monster). Back of a typical Magic: the Gathering card. Collectible card game by Wizards of the Coast that began the CCG craze. 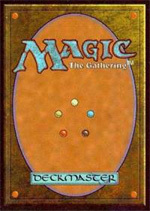 Magic was released in 1993, and has since seen several expansions and editions. Magic: The Gathering and other CCGs are sometimes mistaken as RPGs in media coverage. This may partly be because of the many RPGs that have had card games based on them - Dungeons & Dragons, Shadowrun, Vampire: The Masquerade, Werewolf: The Apocalypse, and Deadlands are just a few examples. Players of a CCG do not normally act out as characters the way that players do in an RPG - rather, the game is more strategy than role portrayal. Term used to describe a character that is under the control of a referee in a role-playing game. NPCs can be seen as the "supporting cast" in the story being played. They can vary from minor "walk-on" parts to the other major characters in the story (such as friends, allies, rivals, & enemies) that are not played by the players. The referee supplies the dialogue and actions for these characters. Abbreviation for New World of Darkness - see World of Darkness, below. Abbreviation for "out of character," a term meaning something that a player does or says when not acting in character. This abbreviation is usually used in online discussions or online games. "I'm really getting tired of this guy hitting me with that giant rubber halibut!" "Is your character actually saying that, or was that OOC?" Abbreviation for Old World of Darkness - see World of Darkness, below. Term used to describe a character that is under control of one of the players in a role-playing game. This term is often used to differentiate from an NPC (Non-Player Character), and is often seen as synonymous with "protagonist." Points awarded by a GM to a player for good roleplaying, acting in character, finding creative solutions to a problem, or otherwise making the game more enjoyable for all. In some RPGs, plot points can be spent later on character benefits, such as new or improved skills or talents; or they can be used to 'buy' in-game perks like a retry on a bad die roll, or a plot twist from the GM. The Faery's Tale RPG, for example, allows players to earn plot points by suggesting a difficulty to the GM that the characters must surmount, and in the same game, plot points can be used to get help from an animal companion or faery guide. Abbreviation for role-playing game. For more information on what a role-playing game is, visit the Basic Gaming FAQ. Term used in Dungeons & Dragons (all versions) for a rule that allows a character to avoid a hazard by rolling a 20-sided die and trying to beat a target number. Saving throws in first and second edition D&D included categories for Paralysis/Poison/Death Magic, Petrification/Polymorph, Rod/Staff/Wand (types of magic items), Breath Weapon (such as dragon's breath), and Spells. Saves in third and 3.5 edition were narrowed to three general types - Fortitude, Reflex, and Will. (from the White Wolf RPGs, but also found in common usage) The referee of an RPG. See DM, above. Acronym for To Hit Armor Class Zero, a term used in first or second edition AD&D. THAC0 is a number in the 1-20 range that allows a player or DM to quickly determine what number he will need to roll to hit an opponent. The latest edition of D&D does not use this term or the mechanic attached to it, but older versions of the game (and the gamers who play those older versions) will mention it. A series of modern fantasy/horror settings by White Wolf Game Studio that includes separate games that can be played individually, or in almost any combination. The series began by allowing players to play vampires and werewolves - the monsters, instead of the monster hunters, in a secret world hidden from the unsuspecting mortals. The World of Darkness setting has been through numerous changes and has added so much material that detailing it all would take up most of this page. Below, you'll find a basic outline of the series and what types of characters and settings are available to play. Vampire: The Masquerade - V:tM put players into the role of vampires (or "Kindred") plotting, scheming, and jockeying for power and control over territories and one another. Werewolf: The Apocalypse - W:tA focused on the earth and environmental issues - the Garou fight the Wyrm, a great corrupting power bent on tainting the world. Mage: The Awakening - M:tA put mages into the World of Darkness who can bend and shape reality to their will, as long as reality doesn't fight back too hard. Wraith: The Oblivion - Players could now play the restless dead in the spirit world. Changeling: The Dreaming - C:tD focused on beings from fairy tales and legends who have been trapped in a banal reality. White Wolf also released two other supplemental character books that could be played along with any of the other games - Gypsies, and Mummy: The Resurrection. In the mid-90s, a series of historical RPGs were released, with four of the five core settings revisited in different historical settings: Vampire: The Dark Ages, Werewolf: The Wild West, Mage: The Sorcerer's Crusade (the Renaissance), and Wraith: The Great War (WWI). 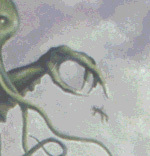 In 1999, a sixth setting was added to the five: Hunter: The Reckoning, which detailed gifted mortals who fought the entities from the other settings. In 2002, a seventh setting was added: Demon: The Fallen. A new Dark Ages series was also released, which included historical books for Vampire, Werewolf, Mage, and another called Inquisitor. White Wolf has recently revised the entire World of Darkness with updated game rules, retitling four of the original core books - Vampire: The Requiem, Werewolf: The Forsaken, Mage: The Awakening and Changeling: The Lost - and adding a new setting, Promethean: The Created. This new incarnation is occasionally referred to as the New World of Darkness, or NWoD, and the older settings are referred to as the Old World of Darkness, or OWoD. Abbreviation for experience points (see above). This document is a work in progress, and is in no way complete as you see it here. If I have left something out, or missed an important point, it is imperative that you, the reader, bring it to my attention. All contributors will receive credit for their contributions at the end of the document.